Summary: Understanding the purposes and principles of a website menu helps designers build more effective menus. Main menu navigation that is easy to use, comprehensive, and tell users how to find what they are looking for will generate better conversion rates for you and your visitors. Creating a website menu or navigation system is one of the most fundamental and crucial tasks in the website design and development process. The main menu and other navigation is a road map people use to find their way around your website, therefore it must be well constructed, easy to use, comprehensive, and intuitive. A good website menu will give visitors confidence, improve the usability of the site, and generate higher goal conversions. A poorly constructed navigation can cause confusion and frustration for end users, preventing them, or the website, from reaching their goals. There are many differing opinions about how to design and build website main menus, and believe me, I have heard many of those theories of the course of my career. Some people prefer mega menus, others like hamburger menus. Some people like organizing by audience roles, others like a task based information architecture. While there is a place for all those practices, what I have found is that a focus on the main purposes of a menu and staying aligned with principles throughout the design and development process is the surest way to end up with a website menu that performs its job well. The following set of website menu purposes and principles are my personal best practices resulting from 15 years in website design and digital marketing. They should not be construed as an exhaustive list, though they will serve as an excellent starting point to help website stake holders throughout the design and execution of the site menu and navigation. Designing website navigation with these principles in mind will help ensure that the site purposes are clearly communicated to the end-user to ultimately facilitate better ease-of-use and higher conversion rates. Guide visitors to the content they are looking for. Perhaps this goes without saying, but in my experience, it needs to be stated—the primary purpose of the main menu is to facilitate the navigation of users to the content and features on the website. If the menu doesn’t do that basic function, it’s really not navigation. Help visitors know what’s available. Related to the first principle, menus should communicate, at a very high level, the type of content and features available on the website. Menu labels should be brief, descriptive, and have good information scent so users can scan it quickly and have a reasonably good idea of what is on the other side of each link. Tell visitors where they are. As visitors browse around the site, a quick glance at a well-designed menu should indicate where they are within the structure, or information architecture, of the site. This is frequently accomplished with highlighted menu items, tab structures, breadcrumbs, or other visual cues. Tell visitors how to use the site. A good menu and other site navigation should be intuitive for users and should help them know how to use the content and features they want quickly and without the need for additional instructions. Give visitors a reference point. Whether visitors drill down into the site by clicking on navigation, or if they deep link into your site by coming from a search engine or another website, the main menu serves as an anchor, or frame of reference. The main menu provides reassurance that no matter how deep they go into the site, they are never lost and can always start over by going back to the home page or other major sections of the website. If you remember these purposes during the menu design phases, and stick faithfully to them through site development, you are going to end up with a main navigation that helps visitors smoothly navigate your site, get to the content they want, and have a pleasant user experience on your site. Adhering to the above purposes will narrow the scope the menu design and execution, yet they still give leeway for an almost infinite variety of menus to be implemented. As you move forward designing and building main menus, it also will help to put into practice the additional principles below. As I have analyzed menus and measured website performance, I have found that sites that implement these principles have higher user satisfaction rates and better conversion rates. Provide a consistent global navigation. Inconsistent navigation, one where menu options are there sometimes and sometime they’re not, or other changes in site navigation between pages can confuse and frustrate users. Be consistent with the main navigation across your site so regardless of what page users are on, or how they got to the site, there is a clear path to high-level destinations, as well as a way back home. Being able to quickly navigate to all major sections will help visitors see more of the available information and features on your site. Make site search prominent. A large percentage of users’ first act on a website is to find and use the internal site search feature. I once analyzed a new website design where the site search feature was hidden behind a menu and usage of it got cut in half. Out of sight, out of mind. 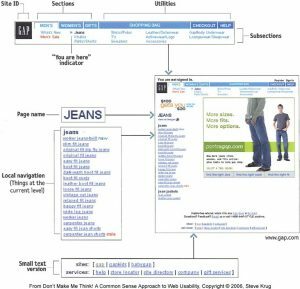 Giving search-oriented users what they want is a simple formula: a text box and a button either with a magnifying glass or the word “search.” Studies on search design show users know what to do from there. Use words people use. Be clear in your labels and do not use company-specific jargon. Titles of menu links should be short, descriptive, and intuitive. Users should easily understand what every link leads to (i.e. information scent). The use of acronyms, which many end-users of a website do not understand, are one of the biggest frustrations I have seen in usability studies I have performed over the years. Have a good information architecture (IA). A good website menu is generally a reflection of good IA, and good IA leads to improved findability and better search engine optimization. 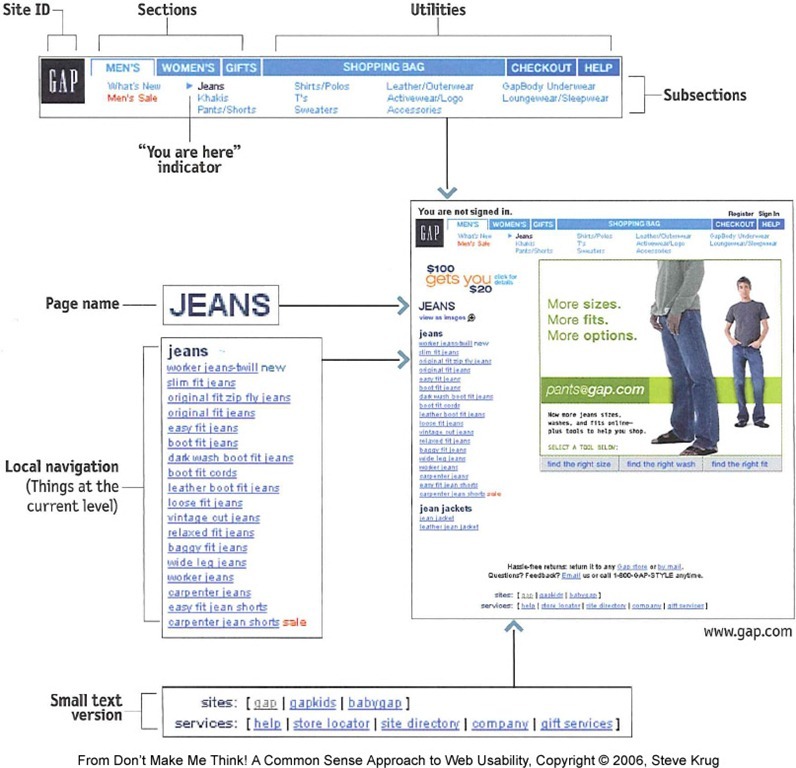 How to put together a good IA could fill tomes, but I highly recommend a class on Information Architecture from the Nielsen Norman Group which I took years ago and has proven very helpful or check out my presentation on What is Information Architecture and How Can It Help My Website? Link to popular content and features. A study should be made of the content and features most used or desired by end-users, and links to those should be placed prominently in the navigation. These decisions may also be driven by business strategies and priorities. If there are key sections and features that you want to steer visitors to, then make them prominent in the menus. Breadcrumbs are good, but not enough. Breadcrumbs show users how they got to a page but they do not communicate where visitors are in the overall scheme of the site. Like a road map, the menu should always make it clear where you are, what other destinations are available, that you can get between points with relative ease, and that you can easily go back to where you came from. Separate utilities from the main menu. Utilities are links to important features that aren’t part of the content hierarchy. They are things like help sections, FAQs, contact information, and the shopping cart. The utilities should be easily findable and always available, but they should be less prominent than the major sections of the global navigation. Only site content goes in the site menu. This is a pet peeve of mine and one I have softened on a little over the years. But as a rule of thumb it holds true, the purpose of a site’s main menu is to help visitors find the content within that site, not other sites. Links to other websites are generally not appropriate in a site’s main menu. When linking to other sites, do so within the content section of web pages and not from the menu. The rare exceptions I have found for this is sister websites, like the careers section of a site which may often be hosted on another domain. I could go on and on with the best practice principles. The information architecture point, particularly, could be dived into much deeper, but these are the highlights for menu design. These purposes and principles of menu design address the biggest concerns and issues you are likely to run into. When you remember these purposes, stay in alignment with them throughout the construction of your website menu, and apply these best practice principles, you are going to end up with a main menu that will help your visitors achieve their goals which will, in turn, make you successful. Site ID: The Indispensable Element of Usable Web Navigation What Defines a Website?